During challenging economic times, Americans try to stretch their dollars. Food is a flexible budget expense that can be reduced when money is tight. have some knowledge of nutrition. handle, store and prepare food properly. When you get home from the grocery store, refrigerate or freeze perishable foods quickly to preserve freshness and prevent spoilage and waste. Refrigerate ripe fruit and fresh cut produce. 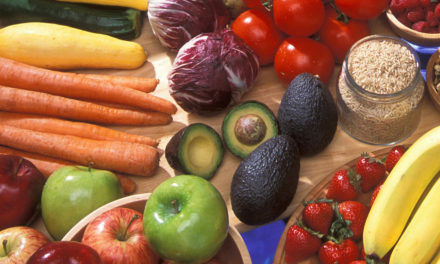 Don’t wash fruits and vegetables until right before eating. It is safe to freeze meat and poultry directly in its supermarket wrapping. However, according to the U.S. Department of Agriculture Food Safety and Inspection Service (USDA/FSIS) this type of wrap allows air to reach the surface of food and may result in freezer burn, or dry, leathery spots on the surface. It is still safe to eat, but you may need to cut away the affected areas for better quality. For optimum quality, overwrap packages of frozen meat and poultry that won’t be used within a month or two. Suitable materials include airtight heavy-duty aluminum foil, paper and plastic wrap that are recommended for freezer use. Another option is to put the supermarket package inside a freezer plastic bag. Repackage family packs into smaller amounts using one of the suitable materials or airtight freezer containers. It is not necessary to rinse meats before freezing. Freeze unopened vacuum packages as is. Take produce out of plastic bags from the produce aisle, because the bags may speed the decay of food. You may be able to extend the freshness of produce by: storing it in reusable “green bags;” putting a digital counter on storage containers to keep track of refrigerator time, or using a device to vacuum-seal leftovers. Examine bags of potatoes, onions, and fruits. Throw out bad items. Keep potatoes and onions in a cool, dry place, and refrigerate fruits and vegetables. Store all other foods correctly so they don’t dry out, become stale or molded. As you unpack cans and packaged foods from grocery bags, write the date on each item. Check expiration dates, because sale items are sometimes reduced right before their expiration date. Put newly purchased canned foods behind older ones in your pantry. Older items, and the ones with the earliest expiration dates, should be out front and used first. Were my purchases economical when compared to other items I might have chosen? Did I stick to my shopping list, unless I found foods that were on sale or cheaper substitutes for other items on my list? If I bought any extras, were they important for meeting my food needs? Were they real bargains? If not, were they healthy treats that were worth the money I spent on them? The most expensive food you buy is the food you throw away. You lose money every time you toss food in the garbage. Two main reasons that you throw away food are because it spoils or it passes its expiration date before you get around to eating it. According to a University of Arizona study, American households throw away about $600 worth of food annually. That is approximately 14 percent of the food they buy, and produce accounts for about one-fourth of that waste. Instead of throwing away overripe fruits and vegetables, find uses for them. For example, use overripe fruit like bananas in muffins, or freeze them for later use in fruit smoothies. The peeling of a frozen banana turns black and may look gross, but the inside is tasty and safe to eat. If you have food waste, ask yourself why. A “yes” answer to any of these questions means you are probably wasting food. Do I buy food in the wrong amounts? Do I plan menus and prepare meals without the input and help of family members? Is food refused or left on the plate? Do I cook foods improperly? Serve “Planned Overs:” Make your food dollars go farther by preparing more meals at home and by saving leftovers. Having a plan for turning excess food after a meal into “planned overs” also reduces food preparation time. Refrigerate perishable leftovers within two hours and use them within the recommended times or freeze them for future use. For more information on safe handling and storage of leftovers, refer to HGIC 3606, Leftovers. Keep a “soup container” in the freezer. You can create an inexpensive, delicious soup, stew or casserole from small amounts of leftover meats, vegetables, and vegetable liquids. Save all leftover vegetables (even one or two spoonfuls) and their cooking liquid. Remember to cool down these leftovers quickly. Use “planned overs” in tomorrow’s breakfast, lunch, dinner or snacks. Use “planned over” vegetables from last night’s dinner in tomorrow’s omelet, salad or pizza. Within a day or two of making mashed potatoes, recycle them as potato soup, patties or shepherd’s pie. Cook a large roast and serve half of it now. Freeze the rest for another quick dish, such as vegetable-beef soup. Stretch ground meat with bread crumbs, oatmeal or tomato sauce. Where available, use fish and wild game. Other Ways to Reduce Food Waste: Before shopping, check the pantry, refrigerator and freezer to find out what you have on hand and avoid overbuying. If you’re up on modern technology, keep a shopping list in the notes section of your cell phone. Buy only the amount of food you can store and use before it spoils. Make sure you know how to prepare an unfamiliar food before you buy it. When putting food in the pantry, refrigerator or freezer, write the date on it. Rotate the oldest items to the front and use them before they expire. Make a written inventory of what is in your freezer and post it in a visible place. 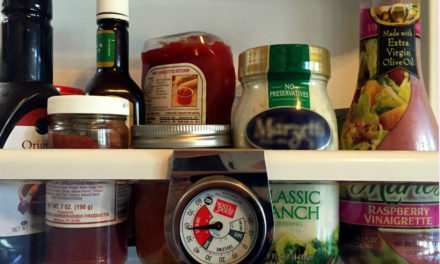 Refrigerate leftovers in see-through storage containers. Reduce the size of recipes you prepare, unless you plan to freeze leftovers in meal-size servings for later. Do “Batch Cooking:” When you have some extra time and money in your food budget, cook a large amount of a food for meals, and freeze some to serve later in the month. For example, cook spaghetti sauce or chili. Eat some now and freeze the rest in family-size portions. Make a casserole or lasagna and freeze half. Label containers with type of food and date prepared. While the oven is hot, bake more than one item at the same time. Select several foods that can be cooked at the same temperature (e.g. a main dish, vegetable, quick bread, dessert or other food). Brown Bag It: Instead of eating out, fix lunches and snacks at home and “brown bag it” to work or school. This is a good way to use leftover food. Encourage children to participate in the school lunch program to eat a balanced meal at a reasonable price. Avoid high-calorie snacks from vending machines at work or school. At home, pack your own cut-up vegetables, fruit or similar items into small bags, and take beverages you bought by the case. Make Your Own Convenience Foods: Since convenience foods usually are not as healthy and cost more, polish your cooking skills and make your own the old fashioned way. Here are some ideas to get you started. Make your own healthy snacks at home by filling small baggies with fresh veggies and fruits, nuts, seeds, low-fat cheese, and whole grain crackers. Cut down on expensive ready-to-eat salty and sweet snacks, which are less healthy and contain chemicals you may not even be able to pronounce. Serve home-popped popcorn, which is an inexpensive snack compared to microwave popcorn or chips. Instead of buying expensive luncheon meats, cook a roast or a chicken and slice it for sandwiches. For a quick breakfast, cook extra pancakes, wrap them separately and freeze. Reheat in the toaster or microwave. Make your own mixes for biscuits, pancakes, and other prepared foods. Prepared mixes usually cost more than homemade mixes. Toast the crusts and end pieces of loaf bread. Crush into bread crumbs and store in the freezer for adding to recipes later. Prepare your own salad dressing and save one-third to one-half the cost. Make your own homemade iced tea. It is cheaper and tastes better than prepared iced tea in jugs, bottles and cans. Mix up your own fruit drinks from 100% fruit juice or frozen concentrate and water. Or, make a light, refreshing beverage by combining seltzer with fruit juice. These drinks can replace excess sodas, expensive energy drinks and coffee shop drinks. You also should reduce the amount of other sweetened beverages and alcohol you buy. Serve breakfast foods for dinner once a week. Take a few minutes to: cut up your own chicken; slice your own fruit; wash your own greens and grate your own cheese, etc. Take the edge off everyone’s appetite by serving a lower cost first course, such as a nutritious soup or salad. Then they will be satisfied with smaller servings of more expensive main dish items. Stretch soups and stews by adding brown rice, quinoa, beans, etc. Prepare meatless meals once or twice a week. For example, make a stir-fry with lots of vegetables and whole grain pasta. Or, add protein to your diet with dried or canned legumes (e.g. chickpeas, lentils and white beans). You’ll save money and eat healthy. To tenderize tougher, less expensive cuts of meat, marinate them or cook in the slow cooker or crock pot. Stretch meats by using them in sauces and casseroles. Keep a small box of instant non-fat dry milk in the pantry to use when you are out of fresh fluid milk. It lasts longer in dry form than fresh milk does, so you have less waste. For better taste, mix it and chill thoroughly for several hours before drinking. Simplify the foods you serve when entertaining family and friends. Plan potluck meals, inexpensive buffets and salads. Serve home-popped popcorn or party mix with a rented movie. Grow your own food. Plant vegetables, fruits and herbs in a backyard garden, a container on the patio, a flowerpot or a windowsill container. If you have more food than you can eat when it is plentiful, then freeze or can the surplus to eat in the winter. To learn more about saving money on food, refer to HGIC 4220, Stretch Your Food Dollars Part 1: Before Going to the Store and HGIC 4221, Stretch Your Food Dollars Part 2: At the Grocery Store.